This project involved the refurbishment of an existing tower building together with adjacent podium buildings and the development of new public realm. The EQ2 Light brief covered all of these elements taking in all of the project components with the exception of the office lighting. The scheme exterior, with the creation of a major new piece of public realm linking Lothbury to Copthall Avenue, was a primary focus of the lighting design with a new vibrant, active night time realm being created. 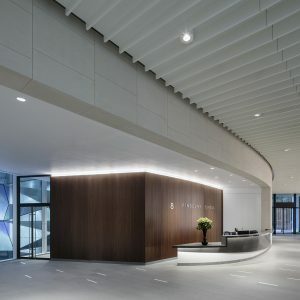 The main tower building has an extensive, split level, reception where the volume and form are illuminated to create positive transition into the building together with an extensive, external night time presence. Angel Court is now a positive addition to London’s cityscape, providing a distinctive location in both daytime and night time conditions.